No version of Lollipop is supported with security updates (as the last one arrived in March 2018 and in November 2017 for 5.0). Android "Lollipop" (codenamed Android L during development) is the fifth major version of the Android mobile operating system developed by Google, spanning versions between 5.0 and 5.1.1. Unveiled on June 25, 2014 at the Google I/O 2014 conference, it became available through official over-the-air (OTA) updates on November 12, 2014, for select devices that run distributions of Android serviced by Google (such as Nexus and Google Play edition devices). Its source code was made available on November 3, 2014. It is the fifth major update and the twelfth version of Android. One of the most prominent changes in the Lollipop release is a redesigned user interface built around a design language known as Material Design, which was made to retain a paper-like feel to the interface. Other changes include improvements to the notifications, which can be accessed from the lockscreen and displayed within applications as top-of-the-screen banners. Google also made internal changes to the platform, with the Android Runtime (ART) officially replacing Dalvik for improved application performance, and with changes intended to improve and optimize battery usage. As of October 2018[update], statistics issued by Google indicate that the Lollipop versions have 17.9% share combined of all Android devices accessing Google Play. Android Lollipop was succeeded by Android Marshmallow, which was released in October 2015. The release was internally codenamed "Lemon Meringue Pie". Android 5.0 was first unveiled under the codename "Android L" on June 25, 2014 during a keynote presentation at the Google I/O developers' conference. Alongside Lollipop, the presentation focused on a number of new Android-oriented platforms and technologies, including Android TV, in-car platform Android Auto, wearable computing platform Android Wear, and health tracking platform Google Fit. Part of the presentation was dedicated to a new cross-platform design language referred to as "material design". Expanding upon the "card" motifs first seen in Google Now, it is a design with increased use of grid-based layouts, responsive animations and transitions, padding, and depth effects such as lighting and shadows. Designer Matías Duarte explained that "unlike real paper, our digital material can expand and reform intelligently. Material has physical surfaces and edges. Seams and shadows provide meaning about what you can touch." The material design language will not only be used on Android, but across Google's suite of web software as well, providing a consistent experience across all platforms. Android 5.0 introduces a refreshed notification system. Individual notifications are now displayed on cards to adhere to the material design language, and batches of notifications can be grouped by the app that produced them. Notifications are now displayed on the lock screen as cards, and "heads up" notifications can also be displayed as large banners across the top of the screen, along with their respective action buttons. A do-not-disturb feature is also added for notifications. The recent apps menu was redesigned to use a three-dimensional stack of cards to represent open apps. Individual apps can also display multiple cards in the recents menu, such as for a web browser's open tabs. Lollipop also contains major new platform features for developers, with over 5,000 new APIs added for use by applications. For example, there is the possibility to save photos in a raw image format. Additionally, the Dalvik virtual machine was officially replaced by Android Runtime (ART), which is a new runtime environment that was introduced as a technology preview in KitKat. ART is a cross-platform runtime which supports the x86, ARM, and MIPS architectures in both 32-bit and 64-bit environments. Unlike Dalvik, which uses just-in-time compilation (JIT), ART compiles apps upon installation, which are then run exclusively from the compiled version from then on. This technique removes the processing overhead associated with the JIT process, improving system performance. Lollipop also aims to improve battery consumption through a series of optimizations known as "Project Volta". Among its changes are a new battery saver mode, job scheduling APIs which can restrict certain tasks to only occur over Wi-Fi, and batching of tasks to reduce the overall amount of time that internal radios are active. The new developer tool called "Battery Historian" can be used for tracking battery consumption by apps while in use. The Android Extension Pack APIs also provide graphics functions such as new shaders, aiming to provide PC-level graphics for 3D games on Android devices. A number of system-level, enterprise-oriented features were also introduced under the banner "Android for Work". The Samsung Knox security framework was initially planned to be used as a foundation for "Android for Work", but instead Google opted to use its own technology for segregating personal and work-oriented data on a device, along with the accompanying APIs for managing the environment. With the "Smart Lock" feature, devices can also be configured so users do not have to perform device unlocking with a PIN or pattern when being on a trusted location, or in proximity of a designated Bluetooth device or NFC tag. Lollipop was, additionally, to have device encryption enabled by default on all capable devices; however, due to performance issues, this change was held over to its successor, Android Marshmallow. A developer preview of Android L, build LPV79, was released for the Nexus 5 and 2013 Nexus 7 on June 26, 2014 in the form of flashable images. Source code for GPL-licensed components of the developer preview was released via Android Open Source Project (AOSP) in July 2014. A second developer preview build, LPV81C, was released on August 7, 2014, alongside the beta version of the Google Fit platform and SDK. As with the previous build, the second developer preview build is available only for the Nexus 5 and 2013 Nexus 7. On October 15, 2014, Google officially announced that Android L would be known as Android 5.0 "Lollipop". The company also unveiled launch devices for Android 5.0‍—‌including Motorola's Nexus 6 and HTC's Nexus 9‍—‌for release on November 3, 2014. Google stated that Nexus (including the Nexus 4, 5, 7, and 10) and Google Play edition devices would receive updates to Lollipop "in the coming weeks"; one more developer preview build for Nexus devices and the new SDK revision for application developers would be released on October 17, 2014. Update schedules for third-party Android devices may vary by manufacturer. The full source code of Android 5.0 was pushed to AOSP on November 3, 2014, allowing developers and OEMs to begin producing their own builds of the operating system. On December 2, 2014, factory images for Nexus smartphones and tablets were updated to the 5.0.1 version, which introduces a few bug fixes, and a serious bug that affects Nexus 4 devices and prevents the audio from working during phone calls. A device-specific Lollipop 5.0.2 (LRX22G) version was released for the first-generation Nexus 7 on December 19, 2014. Android 5.1, an updated version of Lollipop, was unveiled in February 2015 as part of the Indonesian launch of Android One, and is preloaded on Android One devices sold in Indonesia and the Philippines. Google officially announced 5.1 by releasing updates for existing devices on March 9, 2015. In 2015, Amazon.com forked Lollipop to produce Fire OS 5 "Bellini" for Amazon's Fire HD-series devices. ^ "android-5.1.1_r38 - platform/build - Git at Google". android.googlesource.com. Retrieved 2018-04-15. ^ "Android Security Bulletin—March 2018 | Android Open Source Project". Android Open Source Project. Retrieved 2018-06-28. ^ "Android Security Bulletin—November 2017 | Android Open Source Project". Android Open Source Project. Retrieved 2018-06-28. ^ "Android 5.1.1 (LMY47V) hits AOSP [CHANGELOG]". phandroid.com. Retrieved June 21, 2015. ^ "Dashboards: Platform Versions". developer.android.com. Retrieved October 28, 2018. ^ Chester, Brandon. "Google Announces Android M At Google I/O 2015". Anandtech. Purch, Inc. Retrieved May 28, 2015. ^ ""LMP" - Lemon Meringue Pie - Looking More And More Likely As The Official Name For Android L". ^ a b "From Android L to Google Fit: All the new products and features from Google I/O". PC World. Retrieved June 26, 2014. ^ "Google's new 'Material Design' UI coming to Android, Chrome OS and the web". Engadget. Retrieved June 26, 2014. ^ a b c d "Google Reveals Details About Android L at Google IO". Anandtech. Retrieved June 26, 2014. ^ "Google's New, Improved Android Will Deliver A Unified Design Language". Co.Design. Retrieved June 26, 2014. ^ a b "We just played with Android's L Developer Preview". Engadget. AOL. Retrieved June 26, 2014. ^ a b "Google's next big Android redesign is coming in the fall". The Verge. Vox Media. Retrieved June 26, 2014. ^ Smith, Chris. "Android L's heads up notifications feature arrives early through third-party app". Tech Radar. Future plc. Retrieved August 6, 2014. ^ a b "Google I/O: Android L Sneak Peek Reveals 'Material Design,' Personal Unlocking and More". Wall Street Journal. Retrieved June 26, 2014. ^ Mayton, Joseph. "Android L, LG G Watch, update issue and what reviewers are saying". Tech Times. Retrieved August 5, 2014. ^ Haselton, Todd. "Android L Developer Preview Unveiled With Major Changes". Techno Buffalo. Retrieved August 5, 2014. ^ Stephen Shankland (2014-12-19). "How Android 5.0 lets you get raw for better photos". CNET. Retrieved 2015-01-12. ^ "'ART' experiment in Android KitKat improves battery life and speeds up apps". Engadget. Retrieved June 26, 2014. ^ Andrei Frumusanu (July 1, 2014). "A Closer Look at Android RunTime (ART) in Android L". AnandTech. Retrieved July 5, 2014. ^ "Android's next release will include GPU-focused tech for PC quality graphics". Polygon. Vox Media. Retrieved June 26, 2014. ^ Ina Fried (February 25, 2015). "Google Expands Its "Android for Work" Efforts in Bid to Get More Businesses Using Its Phones". recode.net. Retrieved April 2, 2015. ^ "How to set up Smart Lock on Android 5.0 Lollipop". CNET. Retrieved 2 July 2015. ^ "With Android L, Google makes pitch for enterprise users". Computerworld. IDG. Retrieved June 26, 2014. ^ "Google makes full-disk encryption and secure boot mandatory for some Android 6.0 devices". IT World. IDG. Retrieved 20 October 2015. ^ a b Cory Gunther (August 7, 2014). "New Android L Update Arrives for Nexus Users". gottabemobile.com. Retrieved August 9, 2014. ^ "Google releases Android L preview source for Nexus devices". ZDNet. CBS Interactive. Retrieved July 2, 2014. ^ Yi, Bill (July 2, 2014). "GPL projects for the l-preview release". android-building (Mailing list). Retrieved August 19, 2014. ^ "Google just released some hot new images of Android L – here's how you can get them". BGR.com. PMC. Retrieved August 16, 2014. ^ "Android: Be together. Not the same". Official Google Blog. October 15, 2014. Retrieved October 23, 2014. ^ "When and where to get Android 5.0 Lollipop". CNET. CBS Interactive. October 15, 2014. Retrieved October 16, 2014. ^ "Updated Android Lollipop Developer Preview image coming to Nexus devices in a couple of days". PhoneArena. Retrieved October 16, 2014. ^ "Android Lollipop hits AOSP; HTC sets the upgrade pace". SlashGear. Retrieved 24 December 2014. ^ "Google quietly pushes out Android Lollipop 5.0.1 images". ZDNet. Retrieved December 6, 2014. ^ "Nexus 4, lollipop 5.0.1: dialer calls audio does not work". code.google.com. Retrieved December 18, 2014. ^ "Android 5.0.2 LRX22G Factory Image for Nexus 7 (WiFi) Randomly Shows Up". Retrieved December 21, 2014. ^ "Google officially announces Android 5.1". Ars Technica. Retrieved March 10, 2015. 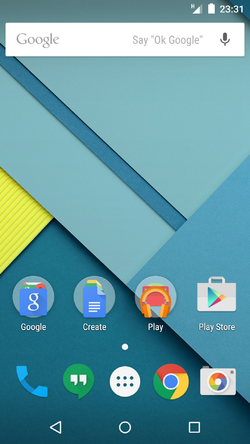 ^ "Official Android Blog: Android 5.1: Unwrapping a new Lollipop update". Official Android Blog. Retrieved March 10, 2015. ^ "What's new in Amazon Fire OS 5 Bellini?". Pocket-lint. Retrieved January 28, 2016. ^ "Amazon's Fire HD 10 tablet a rare misfire for company". Fortune. Retrieved January 28, 2016. ^ "Feature-stuffed Fire OS update makes Amazon's tablets even more kid-friendly". PC World. Retrieved January 28, 2016. This page was last edited on 25 April 2019, at 15:10 (UTC).